Karnataka assembly elections 2018 exit polls by different channels show the state is readying for a hung assembly. While some polls show Congress as the single largest party, others claim that BJP will win the largest number of seats. JD-S will remain at the third spot, according to most exit polls. 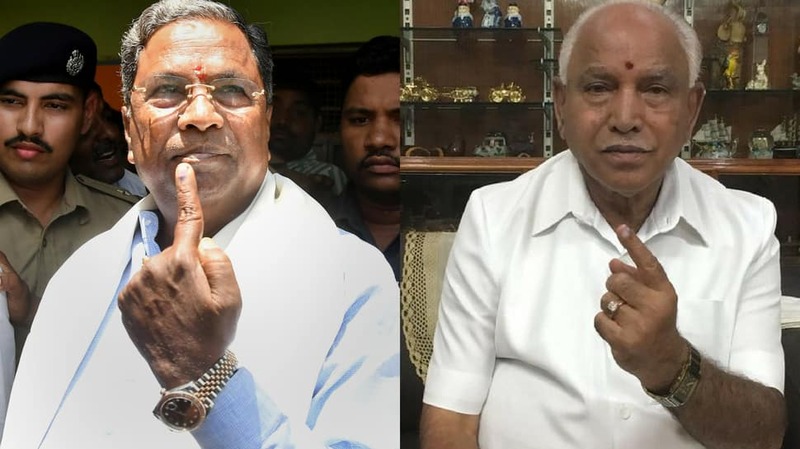 BENGALURU: Will Siddaramaiah-led Congress government retain power for a second consecutive term or the Narendra Modi-powered BJP foil its plan and make a comeback with BS Yeddyurappa at the helm in Karnataka? Will the Janata Dal (Secular) play a spoilsport for Congress and BJP and assume the kingmaker's role? All this will be clear when the votes polled for the 222 assembly seats on Saturday will be counted on May 15. But, before that, several exits polls have been conducted to gauge the voters' mind in Karnataka and give a glimpse of what this election has in store for nearly 5.06 crore electorate of the state. Karnataka assembly elections 2018 exit polls by different channels show the state is readying for a hung assembly. While some polls show Congress as the single largest party, others claim that BJP will win the largest number of seats. JD-S will remain at the third spot, according to most exit polls. Tap here to know more about polling in Karnataka today. Suvarna on Sunday denied conducting exit poll survey for Karnataka Assembly elections 2018. However, according to media channels, Suvarna conducted exit polls on May 12, following the conclusion of voting in Karnataka. The channels showed the following prediction of Suvarna exit poll - Congress 106-118 seats, BJP 79-92, JD-S 22-30 and others 1-4 seats. Digvijay News Exit Polls: BJP: 103-107, Congress: 76-80, JDS: 31-35, Others: 04-08 in Karnataka. According to ABP-C Voter exit poll, BJP is likely to win 97-109 seats, Congress 87-99, JD-S 21-30 and others 1-8 in Karnataka. Republic TV Jan Ki Baat exit polls on Karnataka assembly elections 2018 predicts that BJP will be the single largest party with 95-114 seats. Congress is likely to win 73-82, JD-S 32-42 seats and other 2 to 3 seats in Karnataka. In the 2013 Karnataka elections, Congress had won 122 seats, BJP and JD-S had ended with 40 seats each while 22 seats were won by others and independents. According to IndiaTV-VMR exit poll, BJP may win 87 seats, Congress 97 seats, JD-S 35 seats in Karnataka, the survey predicts a hung assembly. News X-CNX exit poll survey predicts BJP will emerge as the single largest party in Karnataka with 102-110 seats, Congress second with 72-78 seats, JD-S + third with 35-39 and others will get 3-5 seats.